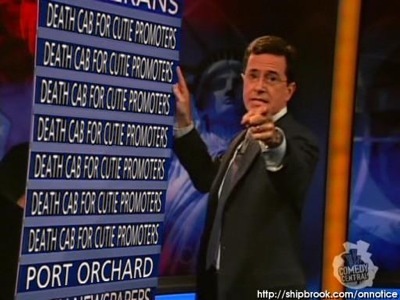 UPDATE: The performers in Death Cab for Cutie are gentlemen and the promoters paragons of graciousness, all previous inferences to the contrary aside. We are compelled to bring back the “on notice” board for a group of people who have about an hour to come correct for the locals. You may recall that I got to cover Bruce Springsteen (who recently endorsed Barack Obama for president) and the E Street Band, but apparently the Kitsap Sun is not haughty enough to have a photojournalist attend the Death Cab for Cutie (whose politics are unknown to me personally) concert, which is scheduled to start at 8 p.m. across the street at the Admiral Theatre. Now, bear in mind that I have no personal stake in this. I can’t think of a single DC4C song I’ve ever heard, so it’s not like I want to go. I’m secure enough in my own oldness that stopping by and getting milk for the family is preferable than a night with the band. But we’ve got reporters here who wear Northface fleece and have iPod headphones (with or without the actual iPods). We’ve got a reporter here who has an actual iPhone, a photographer who was the academic achiever at a Miss Poulsbo pageant (She also, by the way, used to hang out with DC4C band member Ben Gibbard.) and another reporter who won a robotic boxing contest in a Wilmington, N.C. Hooters restaurant. MxPx has never been put on notice, either. Be warned, Death Cab for Cutie promoters, that failure to accommodate the demands of the Kitsap Sun will result in dire consequences. You’ll move from the “On Notice” board to the “Dead to Me” list. It will be, shall we say, the death cab for Death Cab. Oh, and Port Orchard is on the list again just because that’s so much fun for me.